The Curry Stone Foundation is the inspiration of Cliff Curry, a FAIA architect, urban planner and developer, and historical archaeologist Dr. Delight Stone, RPA. 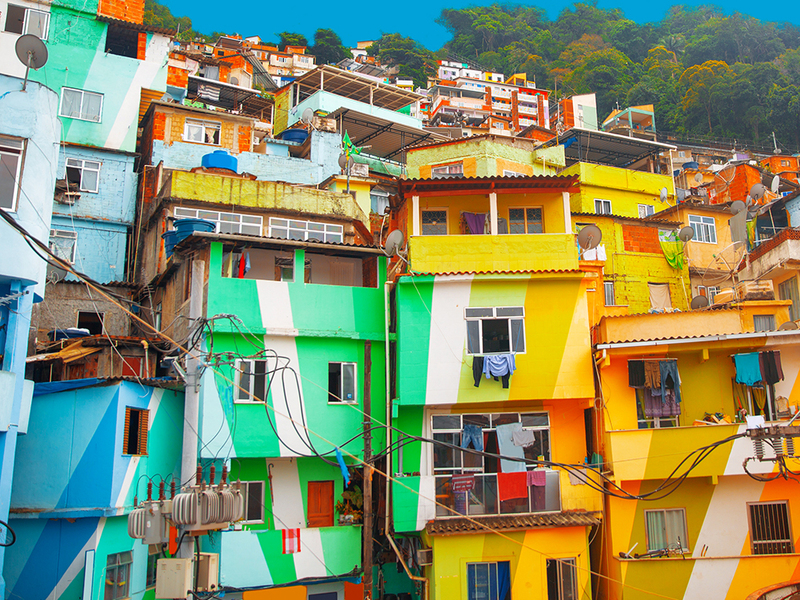 The foundation supports groups and individuals using social impact design to build healthier, more vital communities and actively advocates for the use of design as a tool for social change. The website is a repository for the ongoing podcast series: Social Design Insights. 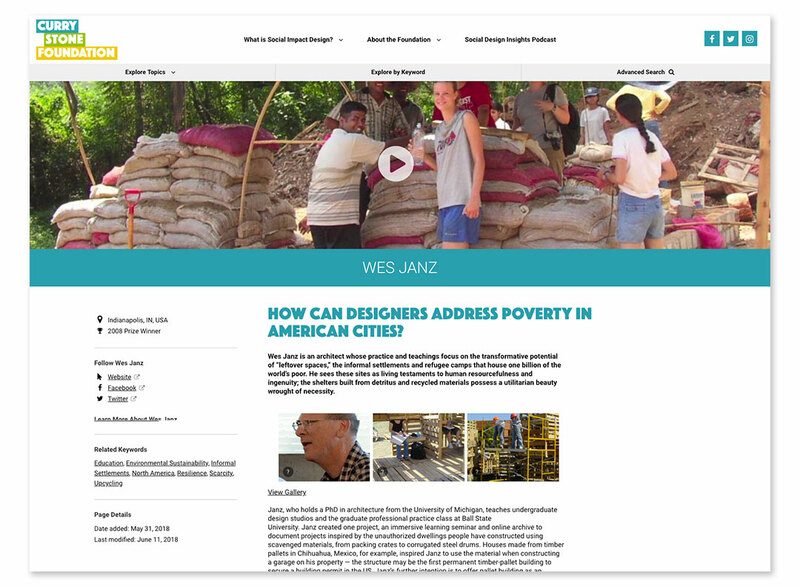 We worked with the Curry Stone Foundation to create a welcoming and accessible destination for the social design community, university programs and others curious to learn how design can be used as a tool to improve lives and address social injustices throughout the world. 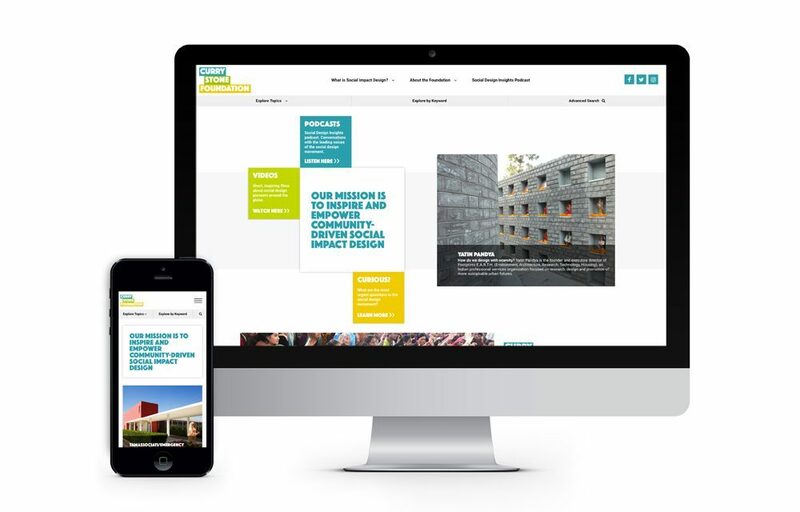 We developed a holistic strategy for the website to create greater accessibly to information, improve the user experience and inspire people to positively change the world through design. The homepage provides an overview of the foundation and gives visitors multiple points of entry into the website, through short films, podcasts, and text-based content. Online accessibility features include high contrast mode that makes the site accessible to those with visual or cognitive impairments that make reading on-screen content difficult. 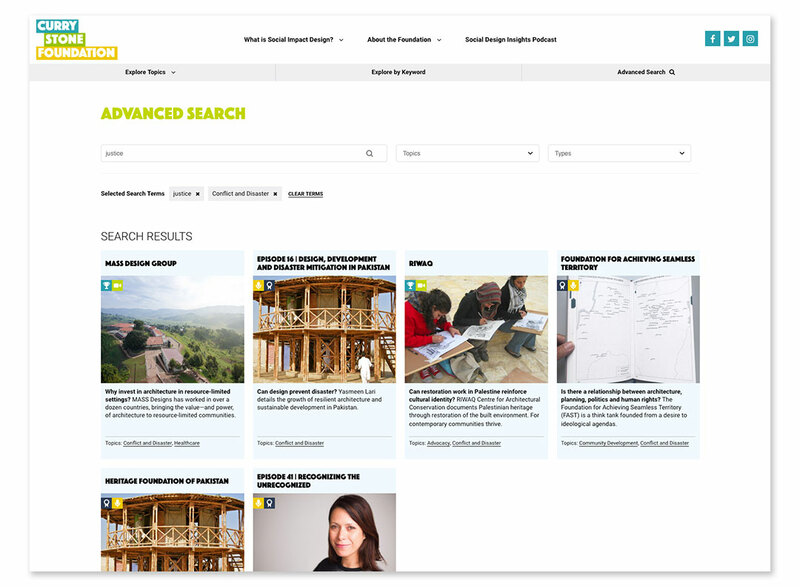 Advanced search allows researchers to filter more than two hundred practices and podcast episodes by topic, keyword, and custom search terms. Search results present users with the most relevant information for their needs and allows new associations to be discovered between practices and podcasts. 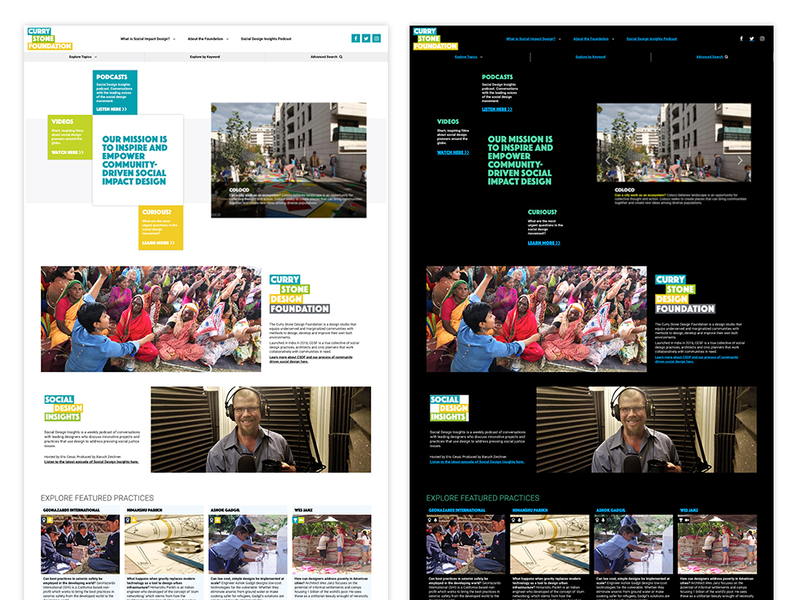 Practice pages highlight individuals and organizations from around the world who are doing transformative work in social impact design. Each page addresses an important question for the design world with a description of the project, gallery, and pertinent links to related content. 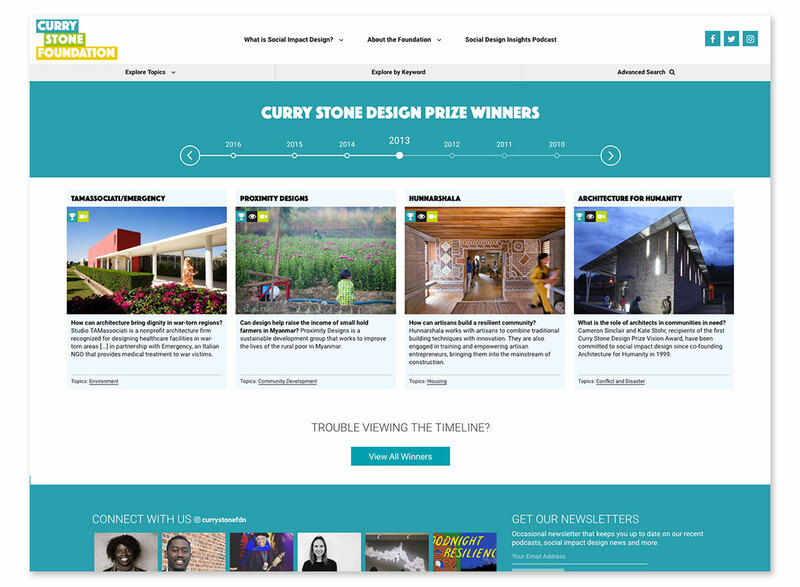 The Curry Stone Design Prize has enabled hundreds of projects that improve the lives of people in communities around the world. The timeline showcases each years’ winning projects and has become a repository of creative solutions for some of the world’s most pressing issues. It has become a valuable resource to inspire, mentor and teach by providing detailed project information so that others may expand upon the work started by the prize winners.